KIRF co-founder Mark Kirwin drove into Haiti this morning with KIRF volunteers Patrick Rea and CJ Paone, in their rented Hyundai van packed to the ceiling with food staples purchased in Santo Domingo. All three are disaster relief volunteers from Ventura, California. Updates of their progress have been made via photos, text messages and calls from Mark's iPhone to KIRF co-founder Angela Kirwin (that's me). According to the representative at AT&T, international phone service from Haiti using Mark's iPhone will be free until the end of this month. As of noon today, California time, they reached Port-au-Prince. "We are in the middle of a huge city. About 1.2 million people are displaced and over 200,000 are dead. No one knows for sure how many," Mark said. "There are tent camps everywhere." KIRF's efficient 100% volunteer disaster relief effort illustrates the efficacy local contacts, cultural understanding, informal aid networks and lay knowledge in distributing aid to those who need it the most after a natural disaster. With these critical factors, almost any able person can do Stage II (non-rescue, non-critical medical care) disaster relief. "The Haitians here are very nice, lot's of smiles. They are very busy. They don't like their picture taken [but] there is no aggression whatsoever," Mark said. Patrick's fluency in Spanish was invaluable in the Dominican Republic in getting relief supplies sold to them at wholesale prices at a super market in Santo Domingo, their van rental, and information about crossing the border into Haiti. His cultural knowledge also resulted in secured parking provided by a local order of Salesians of Don Bosco, a Catholic order dedicated to aiding children of the poor though acts of charity. Their local contacts in Port-au-Prince resulted in invaluable disaster relief assessment and disbursement information. Local information will ensure that KIRF's food supplies will go to those who need it the most. His Haitian friend's hospitality and local knowledge has been invaluable. He offered the KIRF volunteers his home as a safe place to stay after dark and his local knowledge will help distribute aid at a safe and secure location tomorrow. The KIRF volunteers will seek out local Haitian food vendors when they re-stock the van. This is in an effort to support the local economy. If they are able purchase food from local Haitian businesses, they will be supporting not only the Haitian recipients of their aid but the Haitian families who provided it as well. This plan depends on several factors such as security and market prices. Mark and KIRF volunteers CJ Paone and Patrick Rea arrived in Santo Domingo, capital of the Dominican Republic, late at night. 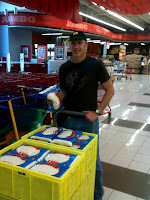 Patrick's Spanish fluency helped them tremendously in securing a van and purchasing food supplies at below market prices. Purchased food supplies included: rice, beans, salami, maize (cornmeal), cooking oil, bottled water, canned tuna, pasta and some chocolate. The van loaded to capacity with food supplies was given secure parking at home of the Salesians of Don Bosco. They drove through the armed border crossing into Haiti easily with local lay knowledge gained in Santo Domingo. Mark said that the roads were packed with people all the way to Port-au-Prince. The landscapes were not as arid or denuded of vegetation as they are in rural Bihar. However, signs of poverty are endemic. "Driving in Port-au-Prince was like trying to drive a van through the Ventura County Fair--or like driving in Gaya [India] but without the cows," Mark said. They met with Patrick's former business partner, a Haitian lives who lives near Port-au-Prince and owns small manufacturing company. He took them to see some small tent encampments of homeless earthquake survivors who were in desperate need of food and water. These camps were too far away from the international food distribution centers and they were not able to get adequat food and water. 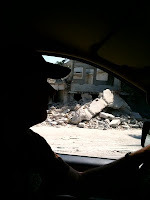 The KIRF volunteers saw street after street of leveled buildings, people living in make shift tents and miles of devastation in every direction. They saw long lines of women with meal tickets patiently waiting in the sun for a food allotment. They saw many children. They visited with an extended family of 14 made homeless by the earthquake and who now share a single tent in one of the many small tent camps that were all over the city. The KIRF volunteers will distribute their van load of food and supplies tomorrow with their local Haitian contacts' assistance. 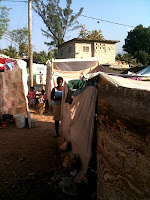 They will purchase more food and supplies, locally in Haiti if possible, for more distribution. We are blessed. Blessings to Haiti.